A red K∴C∴C∴H∴ Scottish Rite cap. Red cap with gold ribbon around its body, a gold cord across the top attached to two buttons bearing the double-headed eagle of the Rite. Emblem on front is a bullion cross, encircled, with a tree design at center. A 20 Year pin from the Valley of Ashville Scottish Rite is attached, front. This cap belonged to Harry E. Rogers, as denoted by a ribbon with his name on it tucked into the plastic ID pocket inside the cap, as well as ID name card/tags included in the case, which is also customized with Bro. Roger’s name on the handle. Included name tag dates from the Sept 11, 12 & 13, 1973 Reunion at the Valley of Ashville, NC. Brother Rogers apparently worked on the “Stage” (crew?). Black Scottish Rite 32° Cap. Gold ribbon around the body, gold cord across the top, attached to two buttons bearing the double-headed eagle of the Rite. Emblem on the front is the Double Headed Eagle of the Scottish Rite in bullion, wings turned downward, with “32” over red in a triangle above. 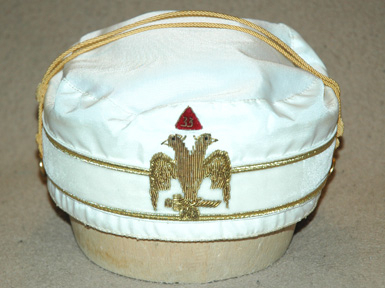 White Scottish Rite (Northern Jurisdiction) 33° cap. Gold ribbon around the body, gold cord across the top, attached to two buttons bearing the double-headed eagle of the Rite. Emblem on the front is the Double Headed Eagle of the Scottish Rite in bullion, wings turned downward, with “33” over red in a triangle above. Belonged to Arthur Edward Golden, whose name is embroidered in to the purple lining, and whose monogram is embossed into the case top. Upturned wings suggests either Canadian or Prince Hall origin. I surmise it may be a PHA SR cap. This cap is also much more boxy and pill-box style and those more commonly seen today. This is probably a newer cap, the bullion being brilliant and clean. Probably unused. White Scottish Rite 33° Cap. Two buttons bearing the double-headed eagle of the Rite. Usual double cord is missing. Emblem on the front is the Double Headed Eagle of the Scottish Rite in bullion, with “33” over red in a triangle over the eagle’s breast.